Youskevitch tells how he was recruited to become a dancer, and his effort to master the role of Albrecht in the classical ballet Giselle. Born in the Ukraine in 1912, Youskevitch and his family fled the Russian Revolution to settle in Yugoslavia. He trained as a gymnast before turning to a ballet career at the age of 20. After intensive training in Paris, Youskevitch began dancing professionally in 1934. He danced as premier danseur of the Ballet Russe de Monte Carlo beginning in 1938. Youskevitch emigrated to the United States during World War II, joined the U.S. Navy, and became an American citizen. After the war, he danced with the American Ballet Theatre in New York. He later returned to Ballet Russe de Monte Carlo as artistic director and dancer. Youskevitch retired from dancing in 1962 and opened his own school in New York. At the time of this interview, Youskevitch was head of the dance program at the University of Texas at Austin. In 1983 he became the artistic director of the New York International Ballet Competition, a position he held until his death in 1994. He was married to Anna Scarpova with whom he had a daughter, Maria; both are also dancers. 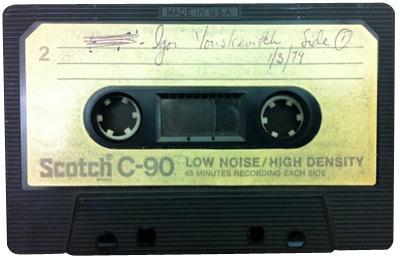 “Igor Youskevitch (published 1982),” Dance Dialogues: Interviews by Barbara Newman, 1979-Present, accessed April 25, 2019, http://dancedialogues.prattsils.org/items/show/21.